You have an important job as a sub. You go into classrooms that are without a teacher and keep students on track. What’s more, you help students through the tough transitions that can come from school staffing issues, and you serve the schools that need the most help. 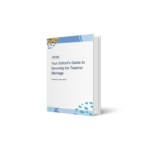 To make your job easier, we’ve put together this comprehensive list of tips, templates, and classroom resources, tailored just for you. To be a great sub, you have to be prepared for the unexpected. Teachers may leave you scant or no lesson plans, students may be unhelpful in getting you oriented to their classroom, and each day may bring new surprises. Since you can’t anticipate the unknown, being as prepared as possible will help you be confident in your ability to think on your feet. Here are some tips on how to get ready for a new classroom. The staff at the school you’re headed to are your #1 resource for making a smooth transition to a new school. Don’t be shy — connect with other teachers at each school you visit. Not only can they help you with any info or questions you need answered, but they can also be great connections for growing your career. Get to school a bit on the early side and try to meet with the other teachers for your grade level. Ask them for the inside school: for example, if the school has any specific “call and responses,” if there’s a standard behavior management system in place, or if you could send a student who is extra trouble to their classroom. If possible, email or call the teacher that you’re subbing for. They’re the expert on their classroom, academic expectations, potential problem areas, and more. If you can, go over the lesson plans with the teacher ahead of time so you can cover any questions you may have. It may be helpful to keep a regularly updated list of questions you always go over with the teachers so you make the most of your meetings with them. The head honcho at the school you’re visiting can give you the lay of the land. Though they may be busy or hard to pin down, be persistent about introducing yourself to them. Especially if the teacher you’re subbing for is unavailable, the principal can be a wealth of info to make your days more successful. The administrators, cleaning staff, and security team can also be a great resource for you. Make sure you introduce yourself to them and ask if there’s anything you need to know about schedule changes, school rules, security protocols, etc. Get your hands on as many resources about the school you’re attending as you can. Let’s face it, students aren’t always your best sources of information about the rules and traditions of their school. Get ahold of the student handbook so you have info on weekly schedules, expectations, school culture, and more. Also, see if there’s a set of guidelines for the staff of the school. This can help you familiarize yourself with the school’s evacuation plan, how to proceed in an emergency, and other crucial information. If a school doesn’t have any guidelines for subs, be sure to ask other teachers or the administration for information on safety protocols, emergency procedures, and staff contact information. If a school has a large or uniquely laid out campus, a campus map can save you a lot of time. If one isn’t available, chat with staff about any aspects of the school layout that might be confusing to newcomers. You may be carrying stacks of assignments home for grading or need to organize your in-school grading by subject, class, or student. It may be hard to get the kids’ attention on the playground, at recess, or even in the classroom if they aren’t familiar with you or queued to pay attention to your voice. A whistle can be a great way to flag your class down. Kids aren’t notorious for being germ-free. Bring hand sanitizer to help you make sure you don’t get sick. Stickers are great both for art time and for little rewards throughout the day. Your school will have the basics, so this isn’t required. But if you have your own cache of special school supplies, such as scented markers or erasable pens, they could be a fun, engaging addition to the classroom. Get to know the students — and let them get to know you! To show students you are interested in them and want to learn a bit about them, engage in some fun introductory games, assignments, or art projects. Name tags will be your best friend, especially at the very beginning of an assignment. You can make your own name tags once you get the class roster. Or you can simply provide blank labels and let the kids express themselves with their own name tag design. To start your class off on the right foot, you can have them work on these get-to-know-you assignments on your first day, especially for elementary students. Have the students work in groups to create posters with all their names on them. They can even include little facts about their favorite things, what they want to be when they grow up, or their favorite subject. You can hang these up in the classroom in a place where you can easily refer to it. As a bonus for you, you can have them create posters that mirror the seating chart. Name games both help you remember your students’ names and help you get to know them by doing a fun activity together. Say a food that starts with the same letter as your name (or a place, a hobby, a state, etc.). The student after you will say what you said (“This is Susan and she likes Slurpees”), and then they will say their name and a food that starts with the first letter of their name. Go around the circle, with each student reciting the names and foods of those who went before them in the circle. Unless you’re subbing at the very beginning of the year, it’s likely the class will already know each other. But that doesn’t mean you can’t play some fun icebreakers together. The students can learn more about their classmates and about you. Icebreakers are also a fun time to set clear expectations and model good behavior throughout the activities. Have students share three statements about themselves — two that are true and one that isn’t. Have the class guess which statement is made up — this is a good way for you to get to know individual students and class dynamics as a whole. Great Wind Blows is a simple and fun game, a bit like musical chairs. One person starts in the middle of the circle and says “Great wind blows for everyone who ______________.” They’ll name some characteristic, such as: has ridden a horse. Everyone who has ridden a horse must quickly stand and find a new seat more than 2 seats away from them. The last player left standing is the new person in the middle. Great wind blows for everyone who is allergic to peanuts. Great wind blows for everyone who loves math. Great wind blows for everyone who has a sibling. Great wind blows for everyone who has traveled out of the country. Great wind blows for everyone who has a dog. For younger grades, you can have them draw self-portraits and tell you a bit about them. You can hang them up in the classrooms too — this assignment is a parent favorite! For older elementary students up to high school, you can do an autobiography assignment that requires a bit more writing. A great way for you to get to know your students — and for them to get to know themselves a bit better, too! For younger students, try picture pairs. Pair students up and give the students blank paper and crayons. Have students take turns sharing five special facts about each other. Each student then draws pictures of the five special facts — without writing words. For older students, you can have them interview each other. They can ask each other open-ended questions about their lives and write up a brief profile. This helps you (and them) get to know one another while working on their writing skills! You’ll likely run into times in your classroom when you need an emergency activity to take up some time. This may happen if your teacher doesn’t leave you lesson plans or if the lesson plan takes less time than anticipated. Here’s a smorgasbord of plug-and-play assignment ideas that don’t require a lot of foundational knowledge, games that are fun for a wide variety of ages, and activities that can further learning. Come to class with a list of writing prompts for kids to choose from. To keep the class’s math skills sharp, you can print out these math puzzlesby difficulty level, so they can be fun for a variety of ages and skill levels. Bring in old magazines and have the students create large collage boards that are relevant to topics you’re studying. They can present their collages to the class, or you can hang them gallery-style for everyone to enjoy. Give them some crayons, markers, and paper and let their imagination run wild. For some sub-specific artwork, check out this great picture-drawing template for younger grades, which prompts students to guess where their teacher might be. As a bonus, the drawings can make a fun gift for when the teacher returns — and give them something to talk about with their class!! Word searches are great for all ages, especially younger kids, and crosswords are fun for older grades. You can tie both to their current lessons, create a thematic list of words for them to explore — or you can even have them create their own! Another great activity for younger kids. You can go around the room and ask them to tell a story about the picture they are coloring. Check out this bank of printable coloring pages. If phones are allowed in your school or if there’s audio-visual equipment available, you can also have the students create short videos of their performances. Hold a spelling bee for the class’s recent vocabulary words. Some students or school admins could even serve as the judges. Have prizes ready for the winners. Brain teasers are a fun activity that you can put on the overhead or read aloud and solve together. Reading aloud together is a great way to calm down a rambunctious class. You can either read to them or go around the classroom and take turns reading together. If your class is struggling with having a sub or you want a way to help kids talk about having a sub, these sub-themed books might be just the ticket. You can set up a rousing game of jeopardy or divide the class into teams to face off on general trivia questions. Online interactive resources can be fun and educational, but they can also keep the class separated on their little individual screens. By tapping free online sites like Kahoot or Quizalize, the entire class can play valuable online games together. The guessing game 20 questions is a simple way to reinforce learning or just have some fun. You can pretend to be a person from their history lesson, an animal they’re learning about in science, or any other person or concept they’re learning about. They ask you 20 yes or no questions and try to guess who you are. Students can also take turns being in the hot seat. Heads Up (available for download on iPhone or Android) is a fun guessing game app with kid-specific decks. You put your phone on your forehead and words appear. Your students shout out clues — without saying the words on the screen — until you can guess what’s on your forehead. Then you move onto the next one. You try to see how many you can guess in one minute. Heads up is a good game for quieting kids down a bit. Seven students come to the front of the classroom. The rest of the students put their heads down on their desk and their thumbs up. The seven students quietly move around the room and put down seven thumbs. The students try to guess who picked them and if they get correctly, they get to take the place of the person who picked them. Telephone is a fun game that illustrates how gossip or not listening well can lead to misunderstandings or falsehoods. The class sits in a circle and one person whispers a phrase to the person next to them. The phrase goes around the circle, from person to person, until the final person says what they heard. Hilarity ensues when the first person says their original phrase. Silent Ball is a great quiet game that also lets kids burn off some energy. This is especially good for rainy days or other days when they may not get as much playtime as usual. Students stand around in a circle. The leader starts by passing the ball to someone else. The final person standing gets to start the next round (or can win a prize). MadLibs are a funny word game you can play with the whole class to create nonsensical stories. They also reinforce grammar studies, as kids have to think on their feet about different parts of speech and name nouns, verbs, adjectives, etc. If you don’t have the MadLib books, you can print out your own. This game is like musical chairs but it incorporates review of material you are teaching in the class. Place student chairs in a circle and remove one chair. Have students walk around the room. When you say “STOP!” (or you can play and stop music), the students must sit in the remaining chairs. The standing student can challenge one of the other students. In the challenge, you ask a review question. The first student to answer correctly wins the round. Consider prizes for the last students sitting. Break the class into small groups and have them play board games. Even if you just do it for 20 minutes or so, it can be a nice way to transition between lessons or fill a parcel of time at the end of the day. Apples to Apples is a great conversation starter that challenges kids to think on their feet. Students are challenged to come up with quick connections by playing cards that are related in some way to the judge’s card. If you don’t have the game, you can print out your own cards. Pictionary is like charades, but instead of acting out scenes, players draw pictures and their team members try to guess what they’re drawing. If you don’t have the game, you can print out your own lists of words. Boggle is a great vocabulary game that asks players to find as many words as possible in an array of letters. If you don’t have the game, you can create your own Boggle bulletin board. Scattergories is a creative thinking game that challenges players to think of as many things in a certain category as possible. The more creative the answers, the more points each player gets. If you don’t have the game, you can use a Scattergories list generator. You know that a lot of your job as a sub is getting the classroom under control. Even the most well-behaved classes can get out of hand from time to time. 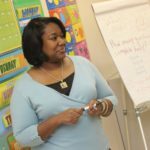 So, here’s a collection of tips and resources you can add to your classroom management toolkit. Since you are new to the students, you have a great opportunity from day 1 to articulate your expectations. You may want to have a conversation about how you may be different than their regular teacher. Emphasize that that’s ok! Everyone is different. It may be good to bring a rules poster and go over it with them so everyone has a clear understanding of your expectations. You’ll likely want to create your own rules poster based on how you’d like to run your classroom, but here are some samples to draw from. Listening bodies, raised hands . . . Respect everyone and everything around you . . . Instead of “I’m done” . . . 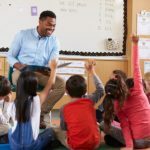 Instead of calling attention to bad behavior, use positive narration to constantly point out the students who are doing what they are supposed to do. This doesn’t mean focusing on the exceptional students or on the kids that are going above and beyond. Instead, you can help students hear your expectations again and again by simply calling attention to other students who are modeling correct behavior by giving these students positive praise. Attention grabbers are sounds or call and responses that help you bring the class to order, collect them after free periods or recess, or quiet them down if they’ve gotten rambunctious. Here are some ideas for tried and true attention grabbers. Bring windchimes or a bell with you to class and ring it whenever you need the class to settle down. Download a free alarm clock app or funny sounds app and teach the kids that when you play a certain sound, it means stop talking and eyes to the front. You call out a math problem, such as 2 + 2 or 8 ÷ 4 and have the students clap back the answer to you. Use these call and responses to calm a noisy classroom and get your students’ attention. Simply countdown from 5 or 10. You’ll likely be able to identify students who like to test the limits pretty quickly. Here are some ideas on how to diffuse their mischief-making. Whenever students get loud, distracted, or seem to have too much time on their hands, put them to work! Have a list of jobs on hand that you can dole out or give every student their own permanent job. Keep open research questions on the board. Whenever a student is idle or making trouble, you can direct them to the research questions. If a student is never “finished” with their work, they can’t have time for disruptions! Who discovered how long a light year is? Why do humans need sleep? How did Martin Luther King, Jr. change the course of history? What are three of Thomas Edison’s inventions? How does a tadpole become a frog? What are the moons of Jupiter? How do the rings of Saturn form? What is Dr. Tin Liu famous for inventing? Coming to your classes with a reward system can really motivate your students. You can either use a point system to earn larger rewards or just dole out small rewards for correct answers or good behavior. 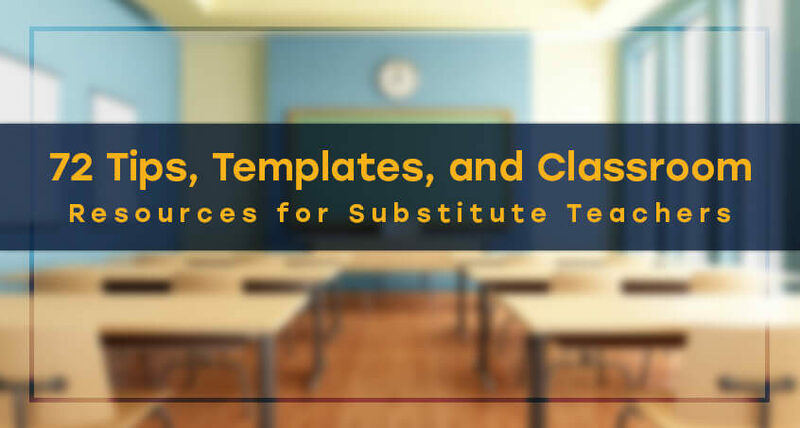 Looking for more resources for substitute educators? Check out our article how to beat stress as a sub. I wanted to respond to the first four tips. They seem to be addressing teachers of record or long-terms substitutes not short-termsubstitutes. I have subbed at a good number of schools in my few months as a substitute teacher–BTW, not just with Swing. If one is constantly switching schools, the opportunity (read, time) for talking to other teacher is very limited. That’s a *lot* of information for a substitute teacher to learn/forget, unless a sub is there for at least a couple of weeks. This, again, is a great idea if one is at a school for longer term assignments. For example, I subbed for 2 weeks at a school and communicated with the teacher both before and during her absence. If the teacher one is subbing for is unavailable, chances are that the principal is even less available. Again, good idea, but not for one- or two-day assignments. The information is, generally, overwhelming. It just takes time and a short-term subs’ time is in short supply. don’t have that available to them. Thank you for your comment! We appreciate you taking the time to respond and your insight into strategies surrounding long-term vs. short-term absences. I’ll pass along your feedback to our team. substitute teaching varies very widely, and perhaps, substitute teachers need to pay stricter attention ti the environment around each school and decide right away whether he or she should return to that school. Some schools have very supportive administrators who understand that the students’ behavior is not a reflection of any particular substitute’s teaching ability and style: Generally, students do not behave well when their regular teacher is not present–that is a given; in that regard, the substitute’s prime role is to maintain order in the classroom and endeavor to get them on task: He cannot make the students do classwork; the school, in most cases, will not stand behind the substitute teacher and demand that the students do the teacher’s assignment. If that class is extremely rowdy and the school does not stand behind the substitute teacher, there is where things go wrong for substitute teachers. Schools that do not support substitutes often unlink them, blaming them for the students’ rowdy, disruptive behavior; and that is where the problem begins for substitutes. Some schools recognize that the problem is not the substitute’s fault and would give him or her a hand; other schools simply unlink you if you cannot make the students obey your instructions. Obviously, if students decide that they are going to take advantage of the substitute situation and misbehave, all the substitute can do is to try to rectify the problem by asking ill-behaved students to go to another class or to the office: In most situations, but that is viewed as being unable to control your class–and you are held accountable for the students’ behavior, regardless of whether it is your fault or not–and that is unfair to you. All substitutes deal with this problem, and there is no grievance system for the substitute. In this regard, substitute teaching is wonderful when you connect with reasonable schools that understand the situation from both ends; and it is horrible when you connect with schools that are high-handed and disregardful of the inherent blind spots and difficulties in ill-behaved classrooms that often go way beyond your control and that the schools themselves would not address. Substitute teachers need some kind of support system that understands the innate conflicts and difficulties involved in going from school to school every day and not being treated fairly by some school. The raw fact of the matter is that students who decide to take advantage of their regular teacher’s absence and bluntly disrupt the class need to be dealt with, and disciplined by, the school; this is what is lacking and that greatly muddies up the substitute’s situation. Even if they decide that your performance is not up to par, the least that they could do is to call you in and talk to you, giving you some pointers of what you can do to manage the hubbub in the classroom more effectively. In this regard, they understand that you did not cause the problem in the classroom. At least, that gives you an opportunity to decide whether you want to go back there or not: That is not what is done int he majority of cases; instead of doing that, the school simply unlinks you from going back there,, thus casting you in a negative to Swing–and that is what is wrong with how many of these schools deal with substitutes. You can go in as a star sub, run into one of these mystery classrooms, and come out unlinkeed without ever knowing why–that is unfair to you, the substitute teacher. I totally agree with you Moultoin. Many students even the good ones will take advantage of having a sub. I have worked in elementary and mostly middle school classrooms in various districts and it is the same. No matter how many times I told the students to be quiet or get to work, they were still loud. I can’t force them to do the work and I can’t send all of them to the office. The most you can do is just make the best of the situation and accept that many students will misbehave. Even setting ground rules and having expectations during the day, chances are students will try and take advantage of you. You cannot raise your voice, I can only clap so much. I even saw a long term sub have trouble keeping the attention of a class.